Book 8 of the Oz series. Illustrated by John. R. Neill. The book actually has little to do with Tik-Tok and is primarily the quest of the Shaggy Man (introduced in The Road to Oz) to rescue his brother, and his resulting conflict with the Nome King. The endpapers of the first edition held maps: the first maps printed of Oz (and the neighboring countries) — Excerpted from Tik-Tok of Oz on Wikipedia, the free encyclopedia. The very marked success of my last year's fairy book, "The Patchwork Girl of Oz," convinces me that my readers like the Oz stories "best of all," as one little girl wrote me. So here, my dears, is a new Oz story in which is introduced Ann Soforth, the Queen of Oogaboo, whom Tik-Tok assisted in conquering our old acquaintance, the Nome King. It also tells of Betsy Bobbin and how, after many adventures, she finally reached the marvelous Land of Oz. 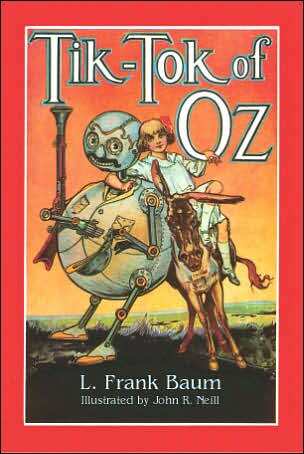 There is a play called "The Tik-Tok Man of Oz," but it is not like this story of "Tik-Tok of Oz," although some of the adventures recorded in this book, as well as those in several other Oz books, are included in the play. Those who have seen the play and those who have read the other Oz books will find in this story a lot of strange characters and adventures that they have never heard of before. In the letters I receive from children there has been an urgent appeal for me to write a story that will take Trot and Cap'n Bill to the Land of Oz, where they will meet Dorothy and Ozma. Also they think Button-Bright ought to get acquainted with Ojo the Lucky. As you know, I am obliged to talk these matters over with Dorothy by means of the "wireless," for that is the only way I can communicate with the Land of Oz. When I asked her about this idea, she replied: "Why, haven't you heard?" I said "No." "Well," came the message over the wireless, "I'll tell you all about it, by and by, and then you can make a book of that story for the children to read." So, if Dorothy keeps her word and I am permitted to write another Oz book, you will probably discover how all these characters came together in the famous Emerald City. Meantime, I want to tell all my little friends—whose numbers are increasing by many thousands every year—that I am very grateful for the favor they have shown my books and for the delightful little letters I am constantly receiving. I am almost sure that I have as many friends among the children of America as any story writer alive; and this, of course, makes me very proud and happy.